The recipe I got for Sriracha Cheez-its from Molly Yeh's blog was so easy to make that I basically just swapped out gorgonzola cheese for cheddar, omitted the sriracha sauce in favor of cracked black pepper to taste and voila, cracker magic. In the interest of not nomming down on ALL THE CRACKERS(! ), I recommend halving the recipe when making the dough and saving a portion to bake another day. This was pretty much the only way I could control myself in the presence of such deliciousness. Trust me, unless you are having a party or have some outlet to share these crackers you don’t want to eat them all yourself. Move oven rack to the center position and preheat the oven to 350 degrees F. Add ingredients to the bowl of a food processor. Pulse about 5 to 7 times, or until flour & butter/cheese comes together in pea-sized clumps. Add in one tablespoon of ice water at a time, pulsing between additions until mixture begins to come together like pie dough. Transfer mixture to a medium bowl and use your hands to bring the dough together in a ball. Cut the ball in half, wrap with plastic wrap and freeze or refrigerate for another day. Place remaining dough on a sheet of parchment paper cut to fit a large baking sheet. Flatten the dough into a disk, then place a sheet of plastic wrap on top. 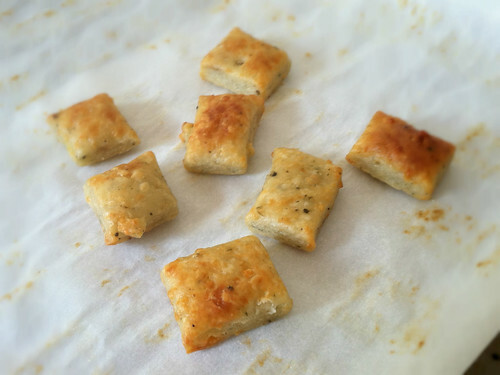 Roll out the dough to about ¼ inch thickness and use a sharp knife to slice 1 inch square(ish) crackers. Place the parchment paper on your baking sheet and arrange the crackers so they have at least a ¼ inch between each cracker. Bake for 10 to 14 minutes or until crackers are golden brown. Store leftovers in an airtight container. A real winner here! Great recipe. Thanks!